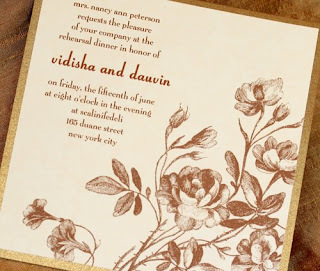 Do you have any suggested wording on an invitation to a reception for a couple who both have been married previously and are getting married in a private ceremony that will take place about a month before the reception? The invitation should highlight that it is an invitation to a wedding reception, not a wedding. See below for some sample text! If you have a wedding related question, Ask the Bee!! My fiance and I are considering doing this, primarily for budget concerns. We cannot afford a wedding, even a small one. Our families live in Tennessee (3 hours apart), and we live in Louisiana. Would it be considered rude if we were to go to the courthouse and get married in August and then have a reception at our house in October? Would out of town guests consider it rude to just be invited to a reception? It is always acceptable to invite someone to a reception but not the invitation. It is only considered rude to invite guests to the ceremony but not the reception. Good luck on planning your at home reception! I hope that you can get some great ideas from my fellow bloggers! I think it is tremendously rude and tacky to invite people to a reception, but NOT the wedding. I feel it should be both or neither, even for destination weddings. A private ceremony in not very in vogue these days but was something done in the past. It is an option for guests want to have an intimate ceremony. There are a variety of reasons for having a private ceremony: religious, location, or military purposes.